Ceinwen, the oldest, was two-years-old when she moved from Thetford to Cardiff. She’s now 10. Naomi was a bump in her mummy’s tummy when Michael, Hyla and I visited Celia and Phil in November of 2000, now she’s nearly six. 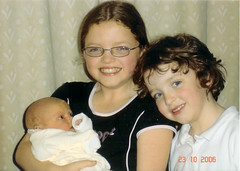 Erin was born on October 22, 2006, a week before I arrived in Cardiff this year. Perfect timing!